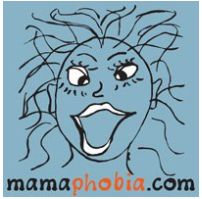 A Little Time and a Keyboard: Mamaphobia Giveaway--Ends Today 08/28/12! Anybody ready for a great night out! I know that I am! I know, we are just a few days into the new school year, but I am sure that everyone already needs some R and R.
Mary Poole, Peggy Ward, and Jeff Hackl in the Mamaphobia Trio will definitely provide you with the opportunity to let your hair down! Writer Peggy Ward and producer Jeff Hackl have created a production that will have you laughing while wiping away a little sentimental tear from your eye as you watch young mother Mary Poole navigate early motherhood. Mamaphobia Trio is currently playing at the Laughing Chameleon in the Glen Town Center in Glenview, Illinois. The cast members are all from the North suburbs, so catching the show is a great way to see and support local talent! You can order tickets on the Mamaphobia website for the upcoming shows (September 6, 7, and 8, 2012). You can also see some great teasers on the website. We are running a giveaway for a pair of tickets to the September 6th show and a pair for the September 7th show. The giveaway ends tonight (08/28/12), so be sure to enter at this link. This is an awesome giveaway!